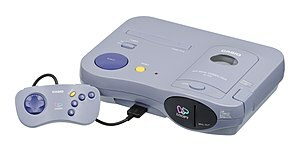 The Casio Loopy (Japanese: ルーピー, Hepburn: Rūpī), subtitled My Seal Computer SV-100, is a 32-bit home video game console. Released exclusively in Japan in October 1995, it was unique in that the marketing for it was completely targeted to female gamers. The Loopy includes a built-in thermal color printer that can be used to create stickers from game screenshots. An optional accessory, called Magical Shop (マジカルショップ, Majikaru Shoppu), is a video capture device to obtain images from VCRs and DVD players. Users may add text to these images and make stickers. Including Magical Shop's own built-in software, the Loopy game library contains 11 titles. The Loopy features one controller port for use with a standard game controller or with a mouse (sold separately). Developer Kenji Terada worked on Loopy Town no Oheya ga Hoshii!. Casio ceased production of the console in December 1998, with software development ending in November 1996. The games PC Collection and Lupiton’s Wonder Palette were both either available as a stand-alone purchase or bundled with the mouse. ^ "Play:Right Rare > Hardware > Casio Loopy". Retrieved 2008-07-10. This video game-related article on computer hardware is a stub. You can help Wikipedia by expanding it. This page was last edited on 18 February 2019, at 10:44 (UTC).